There are many variables at play when we wake up in the morning and face our day to day challenges, whatever they might be. Any number of things can go wrong. Life as we know it is uncertain, despite our attempts at stability and predictability. Uncertainty is uncomfortable. It’s especially tough tolerating uncertainty when a situation is significant to us, and we become attached to a specific outcome. Like a romantic relationship experiencing a rough patch or a chance, you’ll lose your job. When uncertainty is distressing, many of us try to control or eliminate it altogether. What happens then? We pretend to be something that is not true for our life and it makes us unable to move forward. Because that untruth, that uncertainty, about standing in our truth blocks us from all that we were meant to be. This is what exactly happened with me in the past few months. I went through a tough situation where I felt my future is totally out of my control and this uncertainty caused fear in me. Besides, there were people who wanted to bring me down – literally! It was a period of frustration, insecurity, and uncertainty. Just when I thought I have figured out to have control over it, I was tested again and again until one day I surrendered! I surrendered to uncertainty. It gave me a chance to learn about myself at a deeper level. All I could remember was Kwenda Lima’s words during his retreat two weeks back. Stop. Observe. Absorb. Digest and Act. I Stop and asked self, who am I without my attachments and my physical belongings? These questions were quite a shift to my thoughts. I realized, I was ignoring my feelings and resisting the present moment. Yes, me, the one who writes about welcoming all of our experience with a loving, open heart. I was doing everything but. 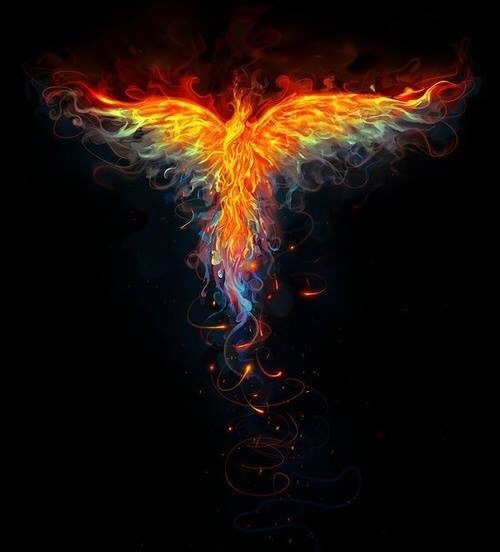 Everything together I felt like Phoenix rising from the ashes. And now I get it. This is the story of my life in the past few months – especially the part about burning ferociously. Life presented me with some challenging circumstances that left me just hanging on. And now, sanity has returned. I look out with fresh eyes. The fog has lifted. I learned Control is an illusion. We can’t control situations. We can only control how we respond to these situations – moment by moment. I learned when you become comfortable with uncertainty, infinite possibilities open up in your life. It means fear is no longer a dominant factor in what you do and no longer prevents you from taking action to initiate change. It gives you the courage to step out of whatever is the lie of your life. We no longer pretend to be something that is not true about us. The situation I am in and those who are involved in it, now no longer have power over me. My experience is not unique – it happens to all of us at some point, it’s a part of the human journey. But this was my time, and I thought to share with you what I’ve learned along the way.